Railpictures.ca - Craig Allen Photo: A lone SD75I powers train 308 through Ramore, Ontario on a nice November afternoon. The white building to the left was once the train station, it has since been repurposed as the town’s fire hall and is currently being used by the volunteer fire service. Unfortunately, the building seems to have a bleak future – a January 16 report recommends that the building be demolished (and a new fire hall be built) due to numerous issues (structural/health and safety) with the building. | Railpictures.ca – Canadian Railway Photography – photographie ferroviaire Canadienne. 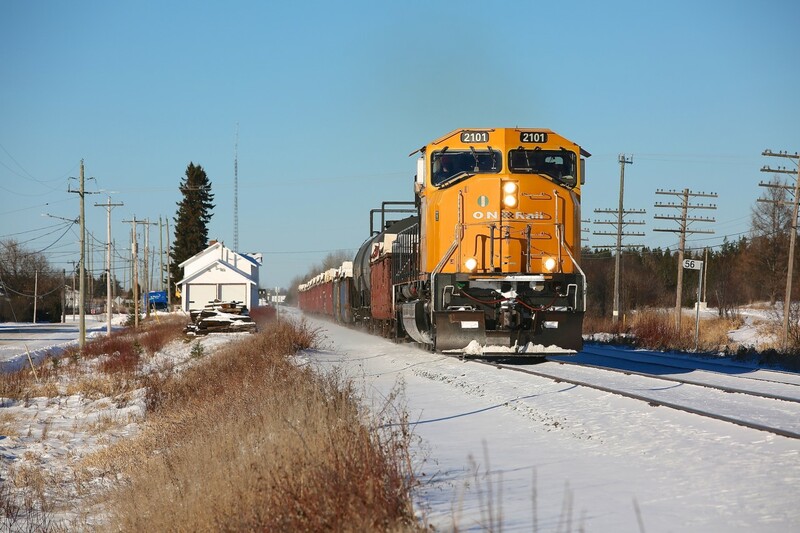 Caption: A lone SD75I powers train 308 through Ramore, Ontario on a nice November afternoon. The white building to the left was once the train station, it has since been repurposed as the town's fire hall and is currently being used by the volunteer fire service. Unfortunately, the building seems to have a bleak future - a January 16 report recommends that the building be demolished (and a new fire hall be built) due to numerous issues (structural/health and safety) with the building. Great shot Craig!! Love the ON-Rail Paint scheme and the sd75I makes it even better. I’d love to see some ON-Rail freight operations some day!